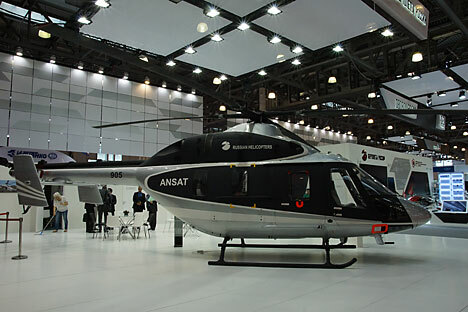 Ansat helicopters can be either passenger, transport, ambulance, or rescue. The Russian Helicopters holding is intensively working up a question to establish an authorized technical maintenance center in Iran with the Iran Helicopter Support and Renewal Company (IHSRC), according to the holding's Deputy Director General, Alexander Shcherbinin. "The Russian Helicopters company is discussing the potential supply of Ka-226T and Ansat light utility helicopters to Iran's Ministry of Health and Medical Education. The issue of the aforementioned helicopters` licensed manufacturing in Iran is also being worked up. We suppose that Tehran has a requirement for 60 Russian-originated light utility rotor-wing aircraft," Shcherbinin said. A spokeperson for the Russian Helicopters said that the holding would conduct the seminar for the Iranian operators and potential customers for the Russian-originated rotor-wing aircraft between Aug. 23 and Aug. 25 for the first time. The company will also demonstrate its multirole helicopters, including the firefighting variant of Ka-32A11BC, the search-and-rescue (SOR) modification of the newest Mi-171A2, and Mi-26/Mi-26T2 heavy transport helicopters intended for emergency services. At present, over 50 Russian-originated rotor-wing aircraft have been registered in Iran. The Mil Mi-17 medium transport helicopter remains the most popular one. Iran uses almost all variants of the aircraft, including Mi-17, Mi-171, Mi-171E, Mi-8MTV, and Mi-8MTV-5, the official added.